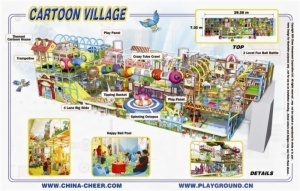 Components Themed Cartoon House, Trampoline, 4 Lane Big Slide, Play Panel, Tipping Basket, Crazy Tube Crawl, Spinning Octopus, 2 Level Fun Ball Battle, Happy Ball Pool. 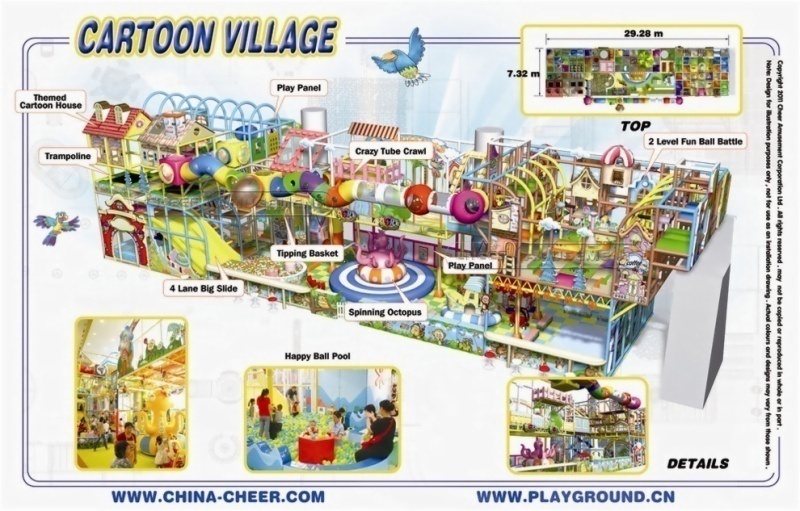 This is a cartoon village themed indoor amusement parks, amusement project is very rich, mainly by the Themed Cartoon House, Trampoline, 4 Lane Big Slide, Play Panel, Tipping Basket, Crazy Tube Crawl, Spinning Octopus, 2 Level Fun Ball Battle, Happy Ball Pool. This attractive system is ideal for any business looking to occupy children on an unlimited time basis. Children can climb, slide, squeeze and navigate their way around this colorful and safe playground while mom or dad, have coffee, workout, do laundry or shop. It will really create the best memory of the childhood of your children and cultivate them a very useful ability of interaction and communication with their little friends and parents when they played in the playground. Ideal for: FEC, CEC, Community Centers, Cinemas, Larger Coffee Houses, Birthday Party Facilities, Retail, Bowling Centers, Museums and many, many more.